Hello all! 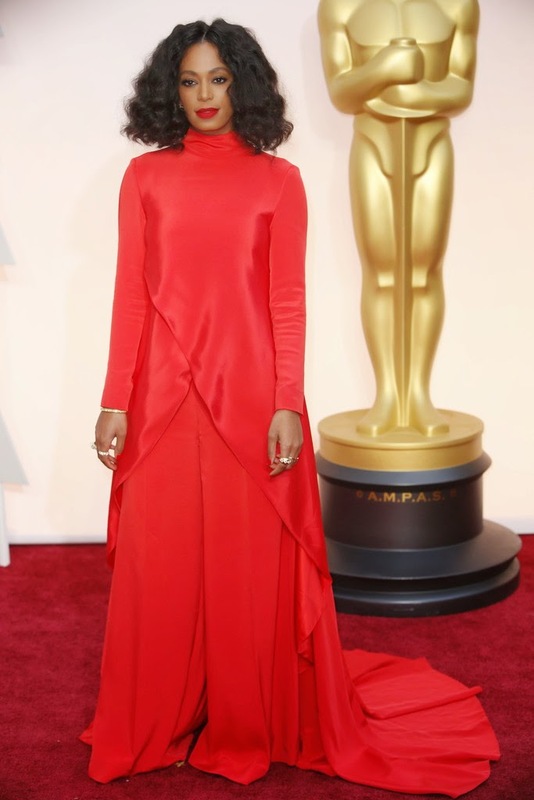 Here you'll find a few of my musings on tonight's Red Carpet looks. Overall, tonight was a strong performance from the men and women of Hollywood. Many actors and actress stuck with their tried and true silhouettes and trusty designers. Surprisingly, the men took some of the biggest risks tonight with varying degrees of success. Without further ado, let's get this party started. Hope you all enjoy and thanks for reading! Patricia Arquette is Rosetta Getty. Personally, I’m a huge fan of a black and white outfit so this look is a winner for me. Arquette frequently opts for the one-shoulder dress and she’s keeping with the trend tonight. 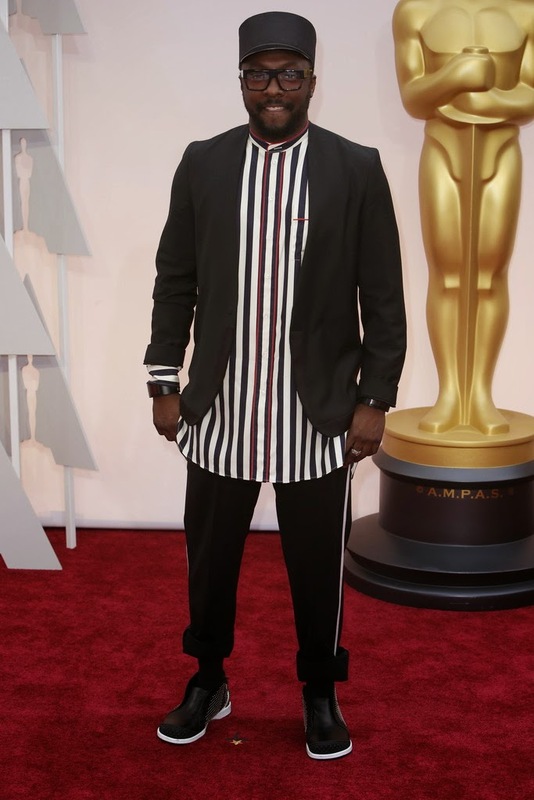 Granted, this look isn’t exactly a fashion risk, but Arquette is bringing some much needed ease and relaxation to the red carpet. Felicity Jones in a classic Alexander McQueen. Alexander McQueen has perfected the high neckline. Felicity proves here that she's not just another English Rose. The color is delicate but the detailing on the bodice adds some edge. Well played Jones, well played. Margot Robbie in Saint Laurent. Robbie is following the 1970s trend well here. Saint Laurent can do absolutely no wrong, but I think ditching the necklace and pulling the hair up could improve the look. With the current accessories, her outfit almost looks like a costume. 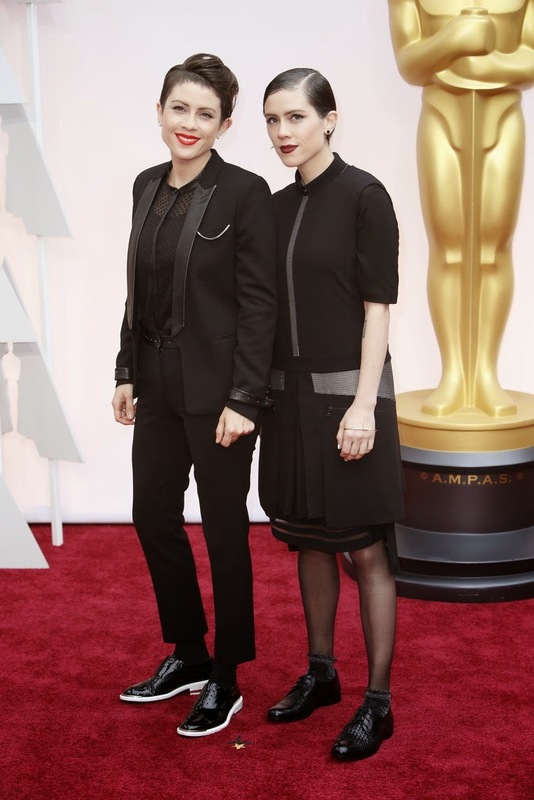 Tegan and Sara in an assortment of black clothing. I get it, you’re musicians. Grace Kelly once walked that carpet – please do not wear sneakers. Another time and another place. Thank you. The same goes for you will.i.am! You look fantastic, but it’s not the occasion. I understand. I usually wear my conductor’s hat on Sundays as well, but sometimes we must refrain. Let’s not pretend that I wouldn’t jump in front of bus for Eddie Redmayne. In the past few seasons combining black and blue has become a trend. 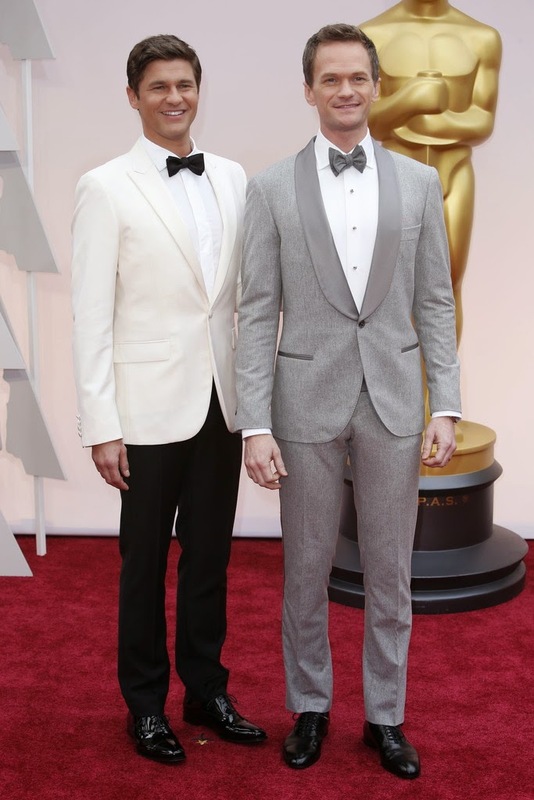 Redmayne does it well in Alexander McQueen. Marion Cotillard looks immaculate as always. She’s got a formula: pick a Dior dress, show up looking amazing, win the hearts and minds of people all over the world. Cate Blanchett can will always be a style icon in my opinion. This woman clearly does not need anyone's validation or praise, let alone mine. Julianne Moore in Chanel Couture. Everyone knows that Julianne Moore loves fashion, as she always looks unbeatably cool on the red carpet. Of course the only way to outdo herself was to casually whip out some Chanel couture. Why? Because she knows you can't beat Chanel Couture. Julianne Moore just won best dressed before the game was even over. Common in Prada. 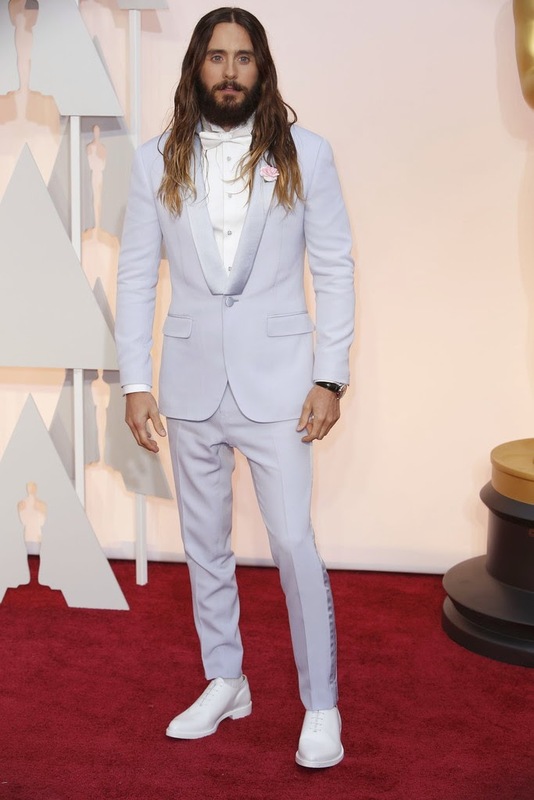 This is how men should take risks on the red carpet. A white bow tie and velour jacket shouldn't work, but they do. As long as the tailoring is good men can get away with a lot. Thank you, Common, for showing these movie stars how it’s done. Lupita N'yongo in Calvin Klein. This is a departure from the usual Calvin Klein simplicity, but it works. I can only assume that each pearl was hand picked from Aphrodite's oyster shell. Neil Patrick Harris. I will compare every Oscar host to Hugh Jackman in 2009. He took the stage in a class Burberry tux. I fell in love that night. I may have been young, but I knew a good suit when I saw one. Harris disappoints on this red carpet tonight. The color is cool and unexpected, but the suit falls flat. Zoe Saldana, in Atelier Versace, gave birth to twins recently and shows up at the Oscars looking this immaculate…what have you done lately? Props to her for picking a dress that compliments her post-baby body so well. Rosamund Pike in Givenchy. The color is beautiful as is the silhouette, but the material and pattern are not my favorite. Ellar Coltrane. I don’t know if any of you have been tracing the style evolution of Ellar Coltrane, but the guy has come a long way. He’s gone from paisley shirts to a suit that almost fits. Keep at it Ellar…but actually though, because I’m a huge fan of yours and I want you to keep acting. Emma Stone in Elie Saab. Stone often choose Elie Saab for the red carpet. The dress is beautiful, as is her makeup. Retro hair styles are making a strong appearance on the red carpet tonight and for good reason. Jennifer Aniston as celebrates her twenty-seventh birthday in Versace. Seriously though, this woman does not age. Solange Knowles in Christian Siriano. This dress is gorgeous, the color is bold, and the hair is refreshing. Solange and Siriano make a great team. We shall end by giving some attention to a little known actress, Meryl Streep. Meryl looks glamorous, effortless, and chic.